32 is the knob as stated. There is no Horizontal adjustment. Can't speak for the MK2 but on the MK1 there IS horizontal adjustement. Adjustment for each light is done by a cross head screw located at the bottom of the bulb access hole. Well that's probably the difference between the Owners Manual and the Workshop Manual then! I'm afraid Mine's just going downwards. It was bad enough changing a headlight bulb last year (without taking the side faring off). I've no intention of trying to get to the aforementioned screw! I have just used your forum to adjust my biffers light - thanks to all. I did however manage to get access to everything by turning handle bars and there is enough (just) room to get your hand in there. Didn't try to replace bulbs or anything but I imagine I would be able to. Sounds like they all came out of the factory with searchlights. 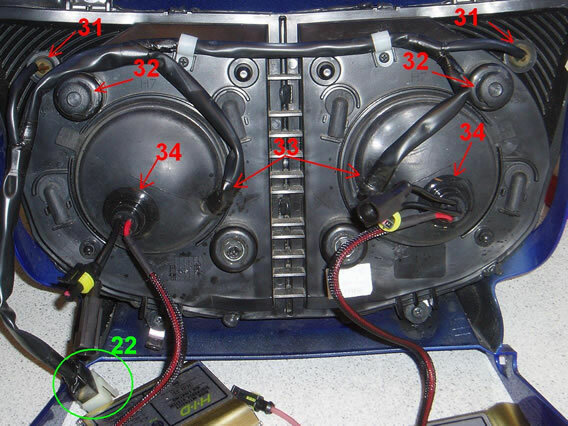 From the Xenon HID installation article. 32 is meant to mark the headlamp adjustment screws, but from that picture it looks like there is another screw looks the same to me diagonally opposed to them on each lamp. Maybe that's the horizontal adjustment. I ride for pleasure, commute mostly by PTW, do most of my own spannering. Started to do my IAM, having done the RoSPA version years ago, seems I'm not fast enough, unlike the Chief Observer I'm not prepared to do 50+ in a 40 limit, so I've given it up as a bad job, 'too slow to pass, too old to care'! I've just seen your 'strap line' reference your IAM Observer doing 50mph and expecting you to do the same in a 40mph zone. I don't know how long ago that was but he would be disciplined to-day as an observer and anybody speeding on test automatically fails. While I personally disagree with an 'automatic' fail for speeding, say when overtaking when the last thing I do is look at my speedo and so long as it is a 'sensible' speed it reduces time on the wrong side of the road and riding alongside vehicles that could pull out. No doubt some of my riding is not strictly in accordance with current IAM RoadSmart teaching, but never-the-less I value everything they taught me and still go out rides with them to get an objective view as to whether I am still safe as I am well past my sell by date.